The 2019 Hidalgo Falls Festival originally scheduled for Saturday, April 13, has been cancelled due to severe weather predictions. The 13-acre Park at Hidalgo Falls is owned by the Texas Rivers Protection Association. It is located on the Brazos River about eight miles from Navasota. It is a private (locked) park available for use only by canoeists and kayakers who have been certified or registered with TRPA, and is not open to the general public for fishing, sunbathing, or swimming. 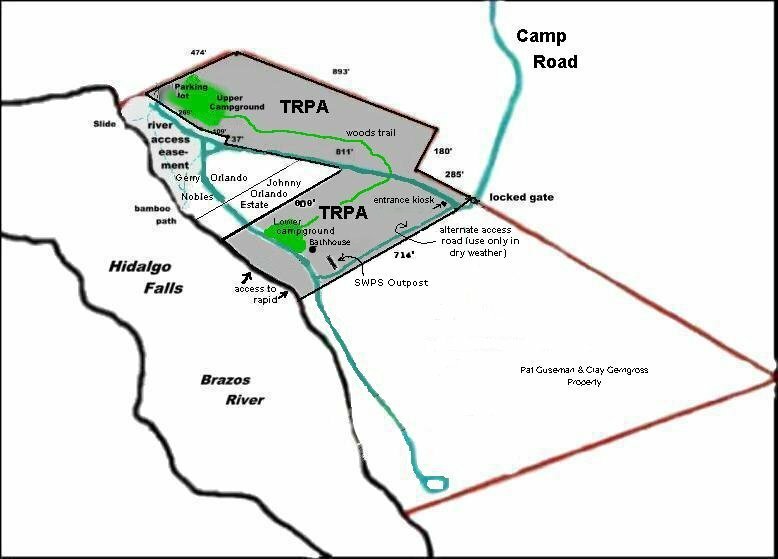 In April 2001, thanks to contributions of more than $65,000 by 160 individuals and paddling organizations throughout Texas, TRPA was able to purchase 10.1 acres of property at Hidalgo Falls on the Brazos River near Navasota. Since then, hundreds of canoeists and kayakers from across the state have used the property, developed camping facilities there, and spent many hours clearing debris. In March 2003, another sixty paddlers, with the support of local, state, and national groups, donated an additional $17,000 to acquire two more acres. In November 2003 we sold three of our acres downstream of the rapid, and with $15,000 contributed by another thirty paddlers, we added another four acres immediately overlooking the rapid. In 2009 and 2010 paddlers again contributed over $25,000 to drill a water well, install a septic fields, and build a bathhouse (with toilets, showers with hot water, and lavatories). TRPA ownership of this property guarantees future kayakers and canoeists access to this popular and unique river resource. For whitewater enthusiasts, it offers a class II rapid with numerous surfing waves, holes, eddy lines and play spots. For flatwater paddlers, it provides a convenient and secure access point for float trips along a very historic stretch of the Brazos as well as a place to learn swiftwater techniques and rescue skills. In the four miles downstream from the rapid archaeologists have unearthed mastodon bones from the riverbank, and the remains of an early 20th-century lock and dam system still loom large in the river. All of this is just upstream from Washington on the Brazos, birthplace of the republic of Texas. Stephen F. Austin is said to have crossed the river often at Hidalgo Falls. It is said that you could tell if you had a knowledgeable riverboat captain if he could get his boat upstream of the rapid and back down before the river level dropped stranding the boat upriver near Millican or Port Sullivan. The fast moving water and play features of the rapid are rarities in this part of the state. During the year volunteer fire departments in the region use the falls for training firefighters in swiftwater rescue. On how to get to Hidalgo Falls, click here. For a "fly-over" view of the river and the property, see the photos taken by James Williams. James also took some photos of boaters playing on the river, working on the property, and enjoying our grand opening on May 5, 2001. On the same page are some photos of Texas Task Force One with a National Geographic film crew at Hidalgo on Sept. 21, 2004 making a documentary about swiftwater rescues. 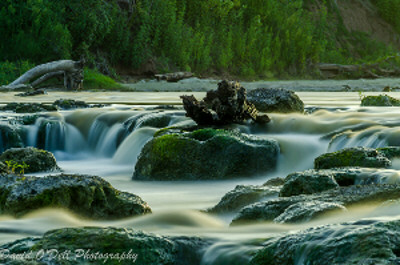 There is always enough water in the Brazos (and even through the rapid) for float trips. Much of the flow is determined by releases from dams upstream on the Brazos (e.g., Lake Waco) and tributaries such as the San Gabriel and Little Rivers. There is usually about a 3.5' difference between the Brazos gauge in Bryan on Hwy 21 and the Hempstead gauge: if the Bryan gauge says 12', the Hempstead gauge reads about 15.5'. If the Hempstead gauge is more than 3.5' higher, that means that Lake Somerville is releasing into Yegua Creek upstream of Hidalgo, and that too needs to be added to the Bryan gauge. [Aaron Smith has come up with a relatively accurate calculator for the river level at Hidalgo: subtract the Bryan level (e.g., 22.24) from the Hempstead level (e.g., 27.07), then multiply that figure (4.83) by 0.55 (=2.66) and add it to the Bryan level to get the current Hidalgo level (24.9).] To see how much water is being released at Lake Somerville, go to the Corps of Engineers website. This is also helpful for those who might want to try a 14-mile float from where FM 50 crosses Yegua Creek to its confluence with the Brazos (4 miles), and then 10 miles on the Brazos to Hidalgo. (The problem with this trip is the 50 mile shuttle.) Playboaters prefer the level to be at least 12', with 17'-22' being super play levels. At 22' there is a great surfing hole at "Spin City" near the bamboo trail. At 23' a fantastic surfing wave forms at the bottom of the rapid. Above 24' most of the rapid washes out. To check the levels, consult the USGS website. If the area between Bryan and Hidalgo (say, College Station) gets a lot of rain, the river could be up at the rapid and it might not show on the Bryan gauge. Just compare the Bryan and Hempstead gauges, subtract the inflow from the Navasota River from the Hempstead gauge, and you can get a pretty good idea of what is happening. Annual certification: be a Protector ($25/yr) member of TRPA (click here to join online or to get a membership form to mail in). Since only TRPA keeps track of donations, memberships, work hours, and club-support, only the TRPA President (Tom Goynes) and the Hidalgo Falls coordinator (Steve Daniel) can give out the combination. Here is the way the certification process usually works. After someone goes through the orientation, the orienter sends the signed orientation form either to Tom Goynes (444 Pecan Park Drive, San Marcos, TX 78666) or Steve Daniel (7988 Drummer Circle, College Station, TX 77845-8087) or leaves it at the property for Steve to pick up in the sign-in box. Steve confers with Tom to find out about the person's status regarding TRPA membership or past HF support or work done at the property. When it is determined that both conditions for certification have been fulfilled, Steve sends the person the combination (usually by email). There are currently about 200 people who have been certified and with whom any paddler can access the property. To arrange to meet other paddlers at the property, interested paddlers should contact other paddlers on the Hidalgo Falls e-group. Visitors must abide by the rules described in the access agreement. Users of the TRPA property can access the river not only from the ramps going down to the river near the Southwest Paddlesports Hidalgo Falls Outpost but also across an easement from the Slide area to the bamboo thicket (the points of access traditionally used by paddlers playing in the rapid). Access to the river across the easement area is for putting in and taking out boats only (no fishing, hunting, swimming, sunbathing), and no parking is permitted in the easement area since it is not TRPA property. Property taxes, electricity bills, and maintenance costs each year exceed $1000, so the paddlers and their friends and families who use the property have to provide donations above and beyond their regular TRPA dues. 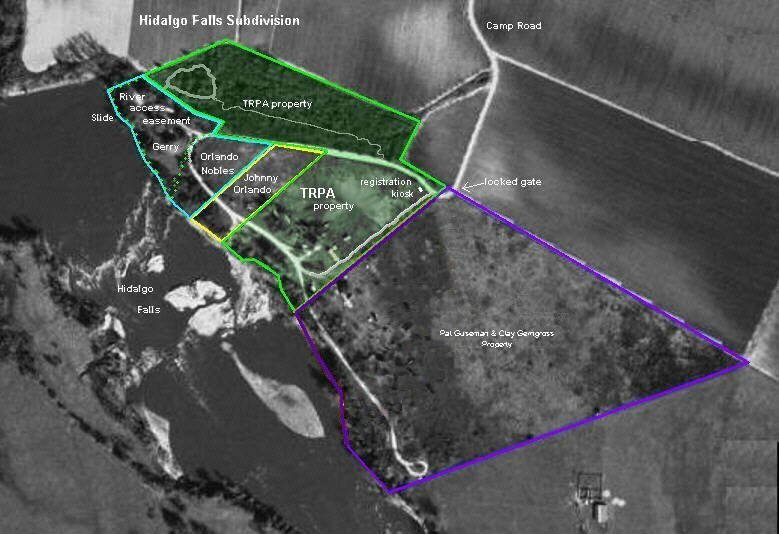 We have also created a fund to be used to purchase additional acres surrounding Hidalgo Falls if they become available. Our long-term goal (which might take decades to realize) is to protect the property near the Falls from residential or commercial development and to create a park to pass on to future generations of river enthusiasts where they can come to enjoy a unique natural resource in this part of the state. Tax deductible contributions can be made to the Texas Rivers Protection Association and sent to Tom Goynes, President, TRPA, 444 Pecan Park Drive, San Marcos, TX 78666. Here is a satellite view of the property and the rapid. David O'Dell has created a book of astonishingly beautiful photos of Hidalgo Falls that presents the falls in ways you have never seen before. Take a quick look at some pages in the book and you'll see why those familiar with the place think this is a great gift for a paddler. David has offered to donate profits for the sale of his 2016 calendars to support TRPA's efforts at Hidalgo. Contact Dave at dlodell@gmail.com. 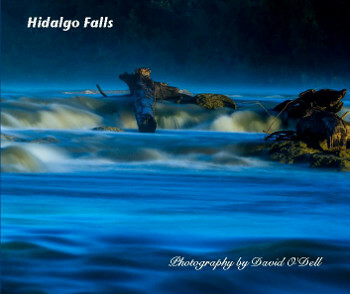 For more information on Hidalgo Falls, contact Steve Daniel. Or you can check out Steve's book Texas Whitewater for Hidalgo Falls pictures and more discussion.